Those of you who were members two or more years ago will remember my ramblings about our villa and what we get up to during our visits. We rent the villa to guests and some members of the club have taken advantage of this and enjoyed the amenities the villa and area have to offer. We have told how we purchased this home and our first Yankee car during a visit in 1994 , the car was bought from a guy named Glen White and this little tale is more about Glen and his present cars as well as the "joys" of owning a Florida pool home. We had been paying out a few more repair bills than normal during 2001 and some for what appeared to be the same jobs, paying for repairs to the repairs ain't my idea of fun. We even got billed for a strip light bulb that friends of ours staying in the villa had replaced. And that wasn't the end of it. The light in the kitchen dining area flickered and I bought new parts the next day and fixed it in 10 minutes, we had paid twice for a light fault to be fixed. After fixing the light I checked the pool, the new surface that was laid 2 years previous that was perfect when we left in May had some dark stains on it. I checked the chemicals and they were out of balance. Calls to the management company went unanswered and to cut a long story short they got the sack so did the pool man. If you have ever thought of owning your own property in the States, be warned. You have to rely on others for virtually everything and pay them for the privilege, our management company was better than most for the first couple of years we were with them, but it didn't last. In May we called round to see Glen but he was in North Carolina where he spends most of the hot summer months. As I walked past his garage a glimpse through the blinds made my eyes pop. I could just make out the rear wing badge of a '57 to 59 Dodge Coronet peeping from under the covers. This was the model I had intended to find in 1994 before spotting my 1967 Coronet at Old Town where Glen had taken it to sell. Apart from seeing the colour was yellow and white I could make out no more details, but if Glen had it, it would be in great condition. I left a note in his mailbox asking him to get in touch if he intended to sell. Back home we went to Tatton Park on the club stand, I decided to put a price on my motor just in case I needed some readies. My Coronet won a trophy for runner up in the 60's American class, on the Saturday. November arrived and it was time to go to the villa again, well someone's got to do it! And as mentioned earlier, it's not all fun. We contacted Glen and arranged to meet him and his lady friend Peggy for a meal at the local Moose Lodge where he is a member. This time the food was not the best but the company and entertainment made up for that. After the Bingo (that's right BINGO) we listened to a country band and watched the local old timers struttin' their stuff. One old guy in bright red from head to foot made Pete Tucker look like a wallflower, another about 90 and over 6 foot 6 inches was almost danced to death by various old floozies before escaping, staggering knackered into the night, being supported by the lucky one. The day dawned when it was time to go out to Glen's just off Narcoossee Road, Route 15. He rolled out the Dodge and his Chevy hot rod and parked them on the back lawn for a photo shoot. It was only then that I realised the Coronet was really special. A very rare beast indeed. Nothing that I could afford without selling the house. One Sunday at the Webster swap meet Glen had mentioned to another chap how he used to sell Dodges in Pennsylvania during 50's and how he would love to get his hands on one that was a bit different. He'd owed a black Coronet sedan in '57 when he had a young family and fancied another. It so happened, just by chance, this fellow knew a couple in Ocala who may be persuaded to sell and the guy was at the Webster meet. The guy , Named Marvin, didn't give too much away about the car but said if Glen wanted to see it he should give them a call, but Glen would have to persuade Marvin's wife to sell as it was her car. Glen thought about it most of the next day then gave Marvin a call and went over to Ocala to see what was on offer. HE COULD NOT BELIEVE HIS EYES. 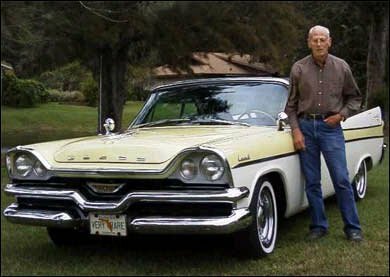 A great looking yellow and white 57 Coronet Lancer. And more, it was a convertible. And more, it came with loads of new spares. And more, it was in excellent condition despite having 97k on the clock. And more, what's this little badge on the rear? D500! It's a HEMI. The '39 Chevy hot rod has been Glen's for some years now. He and the Chevy were the first Old Town Cruisers of the new millennium to appear on the honours board. Built in N.C. and purchased in Asheville N.C. (where by coincidence Paula's nephew is at Uni & he also originates from Pennsylvania like Glen) it is powered by a 350 cid Chevy motor with auto box and an '89 Olds rear set up. The front end is Mustang Mk 2 and power brakes and a/c complete the package. it's nice, but not that nice.